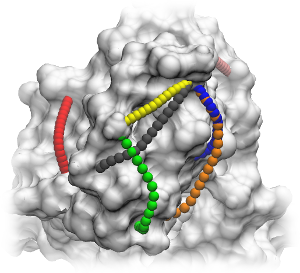 TOPOLINK is a package to compute topological distances between atoms on the surface of proteins and validate structural models using cross-linking experimental data. which are within the linker reach. TopoLink is a package designed to compute topological distances and evaluate structural models, structured with the experimental result in mind. The user provides a description of the experiments performed, the types of cross-links that can be formed in each experiment, and an account of the experimental result, and TopoLink determines how consistent a structural model is with the experimental results. This consistency is evaluated by computing all possible cross-links of the structure and their correlation with experimental observations. Supporting structure files are provided for the visualization of the topological distances on the protein structure, as exemplified in the figures.